There are products, practices and processes that are commonplace to professional water treatment. None of it magic. Everyday, these applications go into service and everyday, technicians applying the treatment have no real idea how it actually works. It just works, it is magic. Reality check: people put gas in their car and drive it down the road without any knowledge of combustion or coefficients of friction. This works because they only wish to drive from point A to point B. This does not work for the mechanic asked to fix the vehicle. People wanting clean water to flow from the faucet do not really care how it happens. Catalytic precipitation, particle adsorption and mechanical straining are not topics that interest users. This is not a luxury afforded a water treatment specialist. Manganese dioxide (MnO2) is an inorganic compound. It is a black to brown-colored material that occurs naturally as the mineral pyrolusite (see Figure 1). In addition to water treatment, MnO2 has many uses, including (but not limited to) the manufacture of batteries, beverage cans, agricultural pesticides and fungicides and electronic circuitry.1 The chemical reactions and physical processes of MnO2 media is a topic every water treatment specialist should understand and be competent in applying for groundwater applications in their region. Manganese dioxide technology is one of the most commonly used and least understood applications for removing iron, manganese, hydrogen sulfide, arsenic and radium. Read along and discover that MnO2 is not magic dust, but a very helpful catalyst used to improve water quality in applications from private wells to large municipalities. The use of manganese dioxide goes back 17,000 years to the upper Paleolithic period when Stone Age men used it as a pigment for their cave paintings. The Spartans of Ancient Greece used MnO2 in their steel making, thus creating weapons superior to those of their enemies. The Egyptians and the Romans used manganese ore in glass making to give the glass pink, purple and black tints. In the mid-18th century, manganese oxide was a main ingredient in the manufacture of chlorine. In 1816, a German researcher noted that manganese increased the hardness of iron, without compromising its flexibility or strength. In 1868, Georges Leclanché developed the dry-cell battery using manganese dioxide. The battery industry is the second largest consumer of manganese today. The uses for MnO2, like many of the technologies used today in water treatment, have a long and storied history. Within the water treatment industry, there are a number of media that incorporate MnO2. Following is a brief discussion of some of media utilizing this catalyst, which range from pyrolusite media with a high percentage of MnO2 to lightweight manufactured media with MnO2 coating. 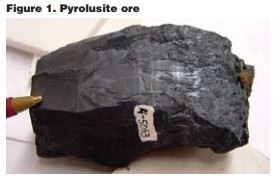 High-MnO2 concentration pyrolusite ore has MnO2 contents to 70-85 percent. This category of media is heavy, weighing around 110-120 pounds per cubic foot. They have a specific gravity (relative density) of 3.5 to 3.8 (see Figure 2). In Figure 1, one sees that it has sheared surfaces and flattened multiple sides. It is solid, high-concentration MnO2 material all the way through the ore. To manufacture it into a usable media, it is broken into smaller pieces ranging from 8 x 20 to 20 x 40 standard US mesh size. This means that the larger material is 0.09 inches (8 mesh, 2,380 micron, 2,380 millimeters.) x 0.03 inches (20 mesh, 841 micron, 0.841 millimeters.) The smaller material is 20 mesh x 0.016 inches (40 mesh, 420 micron, 0.420 millimeters. )5 Having irregular flat surfaces and sharp edges makes the ore an excellent filtration medium. There are several popular media on the market that use a host material and coat it with manganese dioxide. These products are designed to be lighter and require a lower backwash rate. Greensand is an industry standard going back decades. It is a mined zeolite that receives an MnO2 coating. Note: Due to diminishing supplies, companies are manufacturing replacements for greensand. These manufactured media, like greensand, require regeneration with potassium permanganate (KMnO4) to retain their MnO2 properties. There are numerous media options on the market that are manufactured with MnO2 coatings. Some require regeneration to remain active and some use other technologies along with an MnO2 coating to create a catalytic action. These products weigh in the range of 35 to 85 pounds. They have specific gravities from 2 to 2.9 and backwash at 10 to 12 gpm/ft2. The mesh sizes for these products are in the range of 18 x 60 to 12 x 50. All MnO2 media have specific conditions of operation for proper application. Knowing these conditions and closely following the operation instructions makes for a quality system. Specification sheets on these media are easily viewed on manufacturers’ websites (see References). Figure 2 gives an overview comparison of the MnO2 media discussed. While some MnO2 media are heavier and requires higher backwash rates, they do not necessarily use more total gallons of water for backwashing and rinse. The normal backwash cycle for the lighter media is 10 to 12 minutes at approximately 10 to 12 gpm/ft2. The backwash flow requirement for pyrolusite is easily double that at 25 to 30 gpm/ft2. The difference is that pyrolusite media can clear the bed of loading in four to five minutes. In addition, pyrolusite does not require regeneration with KMnO4. Manganese dioxide media filters, as a rule, are most commonly used for the removal of manganese and iron. A byproduct of removing manganese is the removal of radium. This happens because radium bonds readily to manganese. To assist in the removal of radium, some systems use the addition of hydrous manganese oxide (HMO) to increase co-precipitation of radium during the manganese removal process. HMO is added to the water upstream of the filter to attract radium to the manganese oxide precipitates. These manganese precipitates, which hold radium, are filtered from the water along with existing iron and manganese. Through HMO co-precipitation, radium is strained from the water as a solid then washed to drain when the filter backwashes. Systems utilizing co-precipitation through HMO require regular backwashing. The backwash water from this method of treatment contains radium-bearing waste. Compliance with local disposal requirements for radioactive solids must be adhered to when designing and applying these systems for radium control. The goal in the filtration of iron (Fe) and manganese (Mn) is oxidation and flocking6 of Fe and Mn prior to filtering. Water pH plays an intricate role the in success of oxidizing (see Figure 3). Chemically, manganese does not readily oxidize using aeration until pH reaches 8.3 and the retention required to oxidize iron increases as the pH decreases. An advantage in using MnO2 filtration is that Fe and Mn that remain in solution become catalytically precipitated and then adsorb directly on the MnO2 present on the media. Most of the manganous manganese collects on the first few inches of the media where it is further oxidized to manganese dioxide. For arsenic removal processes, arsenic is co-precipitated with the iron onto MnO2 media as ferric arsenate. This process either uses the iron present in the water supply and/or includes a ferric chloride injection system upstream of the filter. The ratio of iron to arsenic required for co-precipitation is approximately 20 parts per billion iron to one part per billion arsenic, although in some cases, the ratio can be higher than 20:1. The use of a beta plant to run pilot studies is an excellent method to determine the correct iron-to-arsenic ratio for adequate removal. This is also true of any phosphate present in the water. Phosphate (phosphorus) is the number-one competing ion in water for co-precipitation using iron. Arsenic (As) and phosphorus (P) are from the same chemical family and adjacent to each other on the Periodic Table of Elements. Iron attracts both, thus making them competitors for iron present in the water supply. When high phosphate is present with arsenic, ferric chloride injection adds iron to the water to provide the correct Fe-to-As/P ratio. Note: never design an arsenic reduction system without first obtaining a complete water analysis showing all the constituents required for the proposed technology. Double check that the results are within the detection levels for the technology. Example: A phosphate result with a 1.0 mg/L (ppm) detection level will not work for arsenic applications. Arsenic is measured in parts per billion. Phosphate results should be expressed in ppb (ug/L). Ask for phosphate results at a 0.15 mg/L detection level and 0.05 mg/L for phosphorus. Ferrous iron catalytically oxidizes as it comes in contact with the MnO2. This same process works to precipitate and convert hydrogen sulfide gas from H2S to water and precipitated sulfur. During backwash, adsorbed manganese, iron, arsenic and precipitated sulfur are expelled as are any insoluble ferric hydroxide particulate growths. Another common process used with MnO2 applications is continuous reaction with the addition of the oxidant, regenerating the media surface and replenishing the manganese dioxide. Common oxidants used in this process are chlorine and potassium permanganate. Adsorption kinetics is related to the media’s manganese-oxide concentration. Continuous regeneration of the media allows for the removal of higher concentrations of undesirables. With all MnO2 media, backwashing is critical. For pyrolusite materials, backwash is more of a power scrub with high-velocity flow. The action of the media colliding during backwash and optional air scour shears off precipitates and in some cases, part of the media. This action exposes new surfaces; since the media is MnO2 all the way through, this helps with the catalytic properties of the bed. Media attrition is a good thing with pyrolusite. During the life of a system, lost media is added every few years to keep the system operational. Media attrition is a normal phenomenon with media-based systems. The average annual attrition rate of these systems is two to four percent. Note: feedwater pressure should be 30 psi minimum; some larger applications require 40 psi. Some of the lighter media with MnO2 coatings require regeneration to maintain their properties; operating specifications indicate the ounces per cubic foot needed to regenerate the media. Working with KMnO4 can offer its own challenges. In areas where the temperature of the KMnO4 mixing tank varies greatly (i.e., outside installations), the solubility of potassium permanganate changes considerably. When the temperature is high, the water dissolves more KMnO4 and when the water cools, the KMnO4 comes out of solution and crystallizes. Crystals attach to the working mechanisms and these deposits become problematic in the mechanical operation of floats and ball checks. The Burgess iron removal method7, another method using MnO2 catalyst, does not regenerate with KMnO4, though it does require dissolved oxygen. 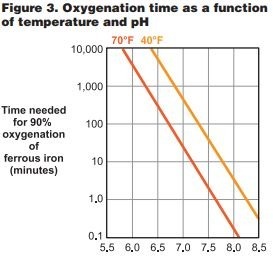 When using this method for iron removal, the water cannot contain oil or hydrogen sulfide; organic matter should not exceed four to five ppm and the dissolved oxygen content of the water should hold 15 percent of the iron concentration with a pH of 6.8 or more. Heavier media has a higher concentration of catalyst. This allows them to handle higher loading rates and have smaller footprints in large systems. The lighter media work well where water for backwash is limited and where budgets are tight. Visit the manufacturer’s websites and become educated with operating specifications and applications for all the media used in your business. Every tool in the toolbox has its designed use. This does not mean that a screwdriver does not become a chisel or a pipe wrench becomes a hammer. While this works, the screwdriver does bend and the pipe wrench does break. The true professional uses a hammer to drive nails and a chisel to remove excess material. Manganese dioxide catalyst is an important tool in the water professional’s toolbox. Understanding media mechanics and being competent with their application is the responsibility of the people working in the water industry. When we use the right tools for the job, we can leave the magic wand at home in the toy box. History of Manganese Dioxide (2013). http://wikipedia.qwika.com/de2en/ Mangan.